Evans is one of two female NBA 2K players who are in the 198-player pool for today’s NBA 2K draft in Brooklyn. The popular basketball game had its first pro season last year, in which more than a dozen real-life NBA teams also had esports teams made of top players of the game. All of those players were men, but, this year, two women, Evans and Brianna Novin, are eligible to be drafted to the virtual Celtics Crossover Gaming, Raptors Uprising GC, or the rest of the league. Evans plays as a small forward, and is in Brooklyn for tonight’s draft. Long before she tried to play virtual basketball competitively, however, Evans was playing the real thing. As someone who spent some of her youth in Chicago during the heyday of Michael Jordan’s Bulls, wanting to get on the court was maybe inevitable. She said she started playing when she was twelve or thirteen, and made it onto her middle school basketball team. Although they won the championship and went undefeated, she rode the bench for the season. That summer, Evans drilled the fundamentals, determined to see some time on the court the next season. She would walk to the park to practice, dribbling there and back. She said an injury ended her pursuit of real-world basketball, so she turned to the virtual thing. She started playing the NBA 2K with 2K09 in 2008. It kept her close to the sport. She started playing competitively with 2K16. 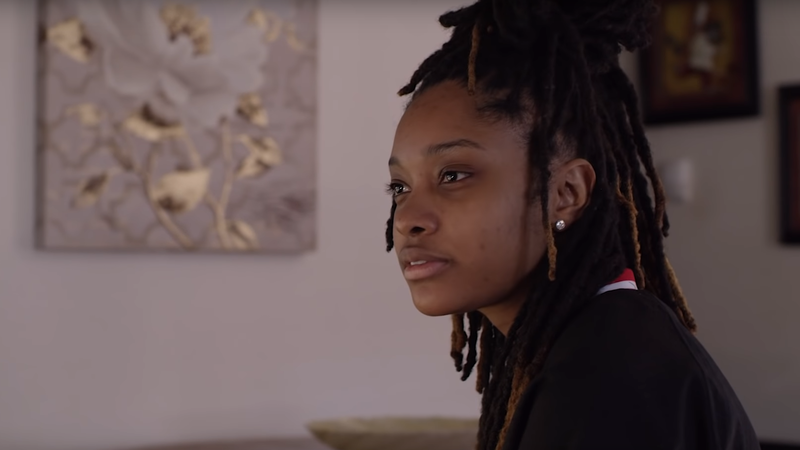 Although she tried to get into the league last year, she met some resistance from other players during the Combine for the first season of the NBA 2K league, a qualifying event for people who are eligible to be drafted which took place last February. In a profile video for today’s draft, Evans said that when she talked on the mic during the Combine, people noticed she was a woman and then stopped cooperating with her. Evans said that with the group of players she normally plays with, being a woman has never mattered and that her current team has four women on it. At that Combine, it was different. She said it got in her head, and she withdrew from the Combine. But Evans stressed that even when the men she was playing with weren’t giving her her due, nothing would keep her from playing basketball. Since last year, league officials have been trying to diversify the draft pool, and now that Evans and Novin are in the pool this year, some of those efforts have paid off. That’s only two of 150 new draft picks though, and Evans is excited to start breaking down barriers. It should be noted that the league did include Evans and some other female gamers at a showcase event last July. She just hasn’t been able to get onto a pro team just yet.